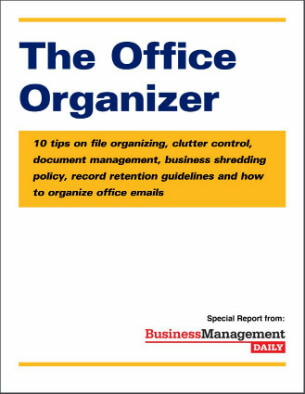 Claim your FREE copy of The Office Organizer: 10 tips on file organizing, clutter control, document management, business shredding policy, record retention guidelines and how to organize office emails! Keep your office operations running smoothly—and ward off chaos and legal trouble—with practical document management techniques for administrative professionals, office managers and HR professionals. If your boss asked you for a particular report, could you instantly put your finger on it? Could you hand it to him while he’s standing over your desk, or would you have to tell him you’ll bring it to him later? Find more filing strategies and other document management tips in The Office Organizer: 10 tips on file organizing, clutter control, document management, business shredding policy, record retention guidelines and how to organize office emails. Organize your files around retrieval. Your goal is easy retrieval. After all, if you can’t find a file, you might as well not have it. Assign toss-out dates to your files. If you never throw anything away, you’ll make the filing cabinet manufacturers very happy, but you’ll waste time trying to find anything. You simply don’t have to keep every scrap of paper forever. Caution: Some documents, for legal or financial reasons, must be kept a specified length of time (see tip #10). Move your paper—don’t let it pile up. To avoid huge piles of paper on your desk, make it a habit to go through the stack several times a week. Start at the top of the pile and do something—anything—with each piece. If you can’t figure out what to do with it then, place it in a holding file, assign it a date and deal with it later. Problem: You create a PowerPoint presentation and send it to five co-workers for review. Over the next few days, you exchange email with them about the presentation, attaching it each time. By week’s end, you’re confused: Has everyone weighed in? Which document is the most recent one? Solution: It could be time to look into wikis. Wiki software allows users to create and update web pages easily, either through a hosted site on the Internet or on your office intranet. Teams can collaborate on a single document in real time without having to send attachments back and forth. “I often type up handwritten reports for my boss, and then the document goes back and forth between us (and sometimes others) for revisions. The problem arises when three, six or nine months later he asks for a copy of the document. I often have problems locating the last version. Usually, I name each successive revision v1, v2, v3, etc., but often, before the final version is distributed, the name is revised slightly or changed. Find three steps that Microsoft Office instructor Tonya Oliver recommends for managing Word documents in The Office Organizer: 10 tips on file organizing, clutter control, document management, business shredding policy, record retention guidelines and how to organize office emails. Share data. Say you want to share files, such as a copy of a presentation or background documents on what’s being discussed. Even if you have a wireless connection, sending clunky files by email takes time. Bring a USB flash drive instead. Take and distribute meeting notes digitally. Digital notes are easier to manage, archive and share than traditional paper notes. For Windows users, Microsoft OneNote has a few notable features that may help: The software allows you to organize notes into sections, flag a note so you can quickly identify it later and convert notes into Outlook tasks, appointments and contacts. Whether your email inbox is cluttered with spam or work-related email, following a few email management techniques can help you gain control of your wild inbox. Find 4 email management techniques for Outlook users in The Office Organizer: 10 tips on file organizing, clutter control, document management, business shredding policy, record retention guidelines and how to organize office emails. Is it possible to clear out an email inbox—and keep it clear—daily? Yes, but you must be willing to change your behavior, says Michael C. Hyatt, president of Thomas Nelson Publishers, who writes on his blog about taking control of his own inbox. Do: Take action on the task now. Follow the two-minute rule: If you can do what’s being requested in less than two minutes, do it immediately. “This gets stuff off your to-do list before it ever gets on it,” Hyatt says. Delegate: Pass the task along to the person best equipped to handle it. Defer: Consciously decide you will do the task later. Either add the task to your to-do list or schedule an appointment with yourself to complete it. Federal court rules on electronic discovery now require employers to retain vast amounts of information for use in litigation. Until a few years ago, companies regularly deleted email records from computer systems. Now discrimination, harassment and hostile work environment litigation often includes email and instant-message evidence. Learn more about what email retention steps you must take in the event of a lawsuit in The Office Organizer: 10 tips on file organizing, clutter control, document management, business shredding policy, record retention guidelines and how to organize office emails. Every employer must comply with the Federal Trade Commission’s records disposal rule, designed to protect employees from falling prey to identity theft. The rule stipulates that you must “reasonably” destroy paper and electronic records containing identifiable data on job applicants and employees, such as Social Security numbers and credit histories. However, the rule doesn’t mandate any specific type of disposal method. For paper files, it suggests shredding them; for electronic files, erasing them or using some other “responsible” means. Caution: If you don’t properly destroy this data after its statutory retention period expires, you’ll face hefty penalties. Just one mistake here can result in a civil fine of up to $2,500 or, under the worst-case scenario, a class-action lawsuit. Before you can establish an efficient records management system, you have to know what you have and how long to keep it—legally and for your own business purposes. That’s why it’s important to inventory your records and draw up a company record retention schedule. Business Management Daily has developed a comprehensive record retention schedule that reflects standard business practices. Simply enter your email address in the box below to receive a sample record retention schedule. Caution: Don’t forget to also consider state and local statutes of limitations, as well as regulations of government agencies that pertain to your business. Check with your state and regional authorities for details. As an extra safeguard, have your CPA and your attorney review your records retention timetable before putting it into practice.